Looking down Glen Lane, toward the Valley Gates. 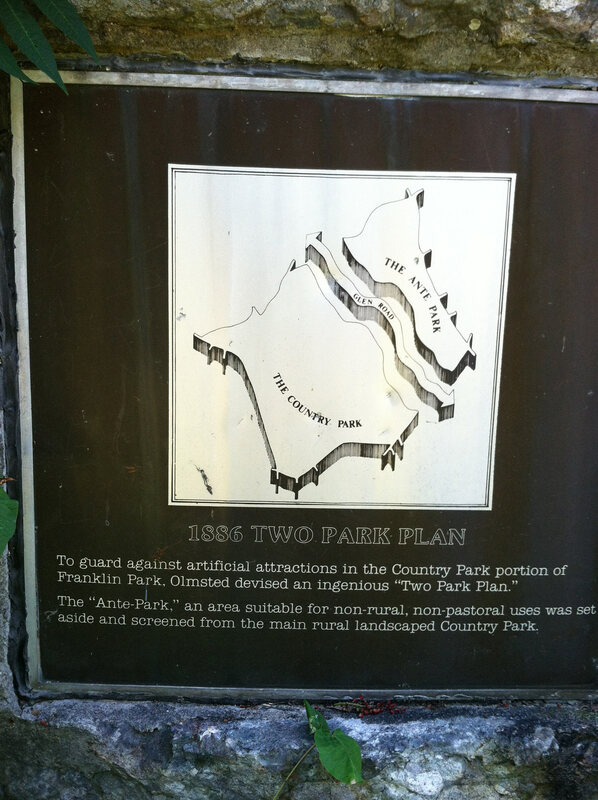 This placard atop Scarboro Hill shows the plan for the Park and the Ante Park. 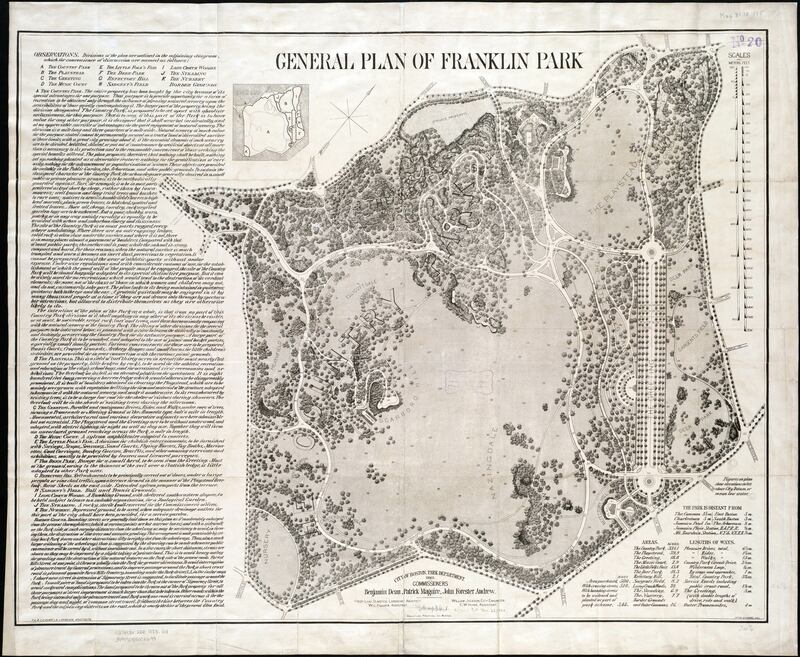 When Frederick Law Olmsted was planning Franklin Park in Boston, he decided to divide the park into four sections. 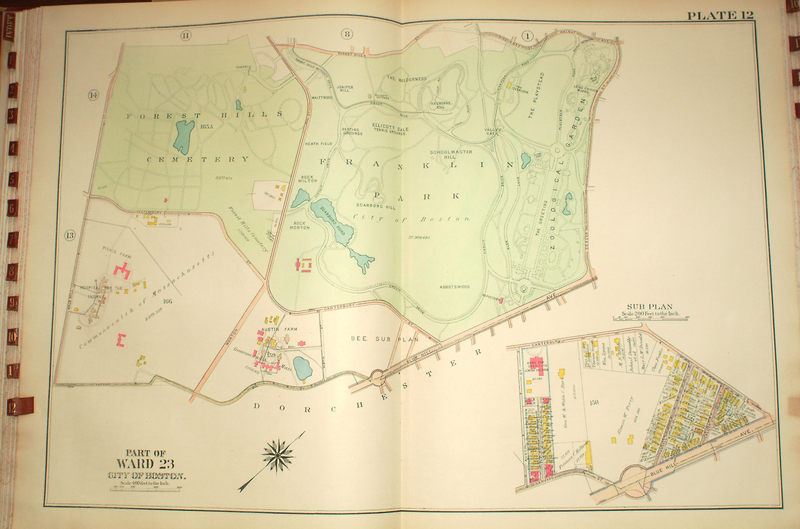 Two of these sections, the Country Park (now the golf course) and The Wilderness, were for enjoying nature. The other two sections, The Playstead and The Greeting (now the Zoo) were for public events, sports and more community-oriented uses. This portion was to be The Ante Park. 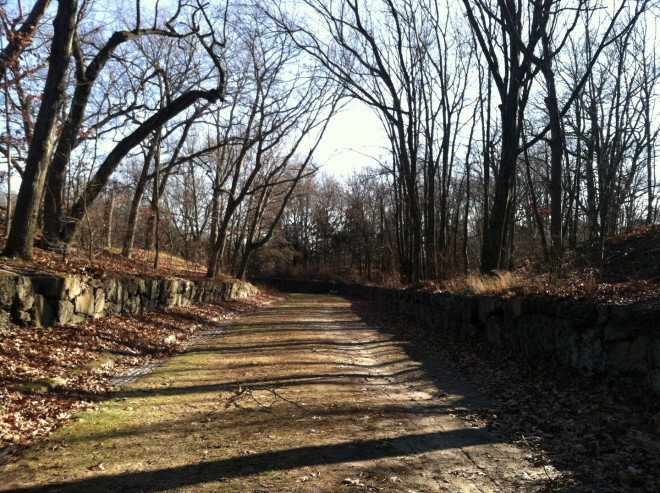 Separating the two halves, putting a physical and psychological barrier between the natural enjoyment and the community uses of the park was Glen Lane, a road running through the Valley Gates from Washington Street to Blue Hill Avenue. Because in Boston all roads must have many names, most people know Glen Road (the portion outside Franklin Park) as Green Street. If you get off at the Green Street T stop and walk toward the park, the street changes names to Glen Road when you cross Washington Street. Once it enters the park, it’s known as Glen Lane. Today this sunken road is barely used, probably because it is unpaved and also because most of it is inside the fence of the Zoo. But a portion of it is intact and recently restored, and it contains a small mystery I can’t really explain. For much of the last year, the Parks and Recreation folks have been working on the Valley Gates, doing some restoration and other necessary work. During this time, Glen Lane has been fenced off and closed, so it wasn’t until recently that my wife and I decided to walk up the sunken lane. I’m always on the lookout for things in the park to write about or take pictures of, and about 10 feet down Glen Lane I was rewarded. The lane, as I’ve mentioned, is sunken between two rocky knolls, a smaller one on the side of The Overlook and a steeper, rockier one on the side nearer to the Balance Rock. Carved out of rock of the larger knoll is a giant square space, separated from the lane by a high stone wall with two entrance gates. 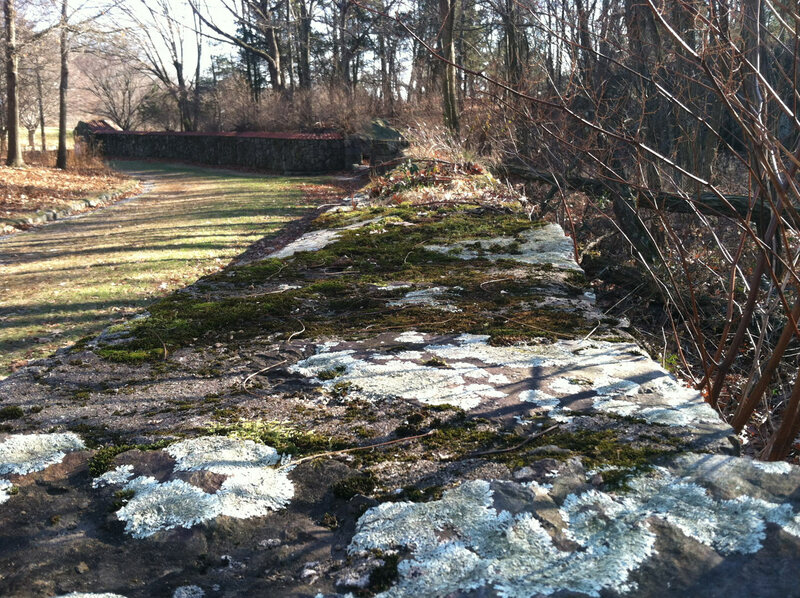 It’s about 50 feet long and perhaps 20 feet deep, surrounded on three sides by steep rock walls topped with dense woods. Today I went over and took a closer look at this alcove. I really have no idea what it was for, but now it’s completely overgrown. The trees are large, so it hasn’t been used for a long time. But what was it? My first thought is that it might have been for an early zoo exhibit, like the Bear Cages and the Raccoon Cage, because I guessed that maybe there were other cages on the perimeter of the Playstead. However I can’t find any justification for this in the maps, and the place doesn’t feel like the other abandoned zoo exhibits. It lacks the wrought iron and elaborate stone work. The entrances are too small for vehicles, and there is no sign of metal hinges to hold doors, so I suspect this was an open space that people could enter and leave at will. 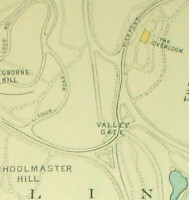 Detail from the 1914 map, showing the Valley Gates. No alcove! Returning home, I started looking over the maps. 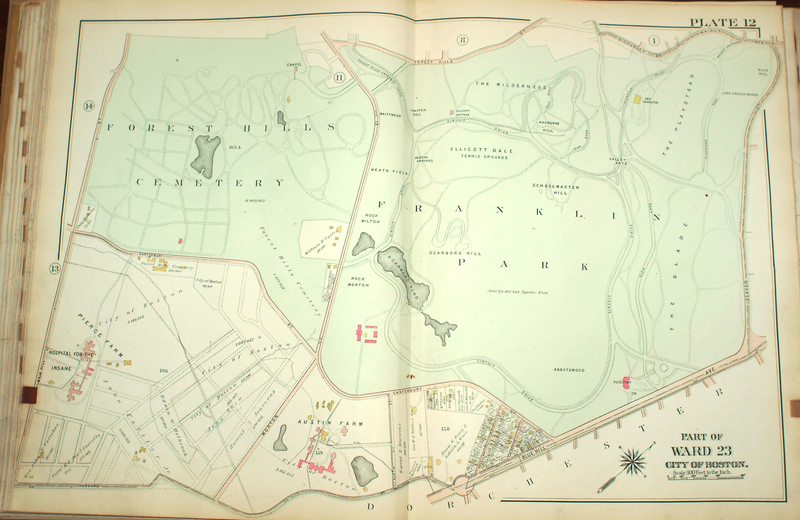 The Jamaica Plain Historical Society has four maps of the Park from 1896 to 1914, and I checked them all. 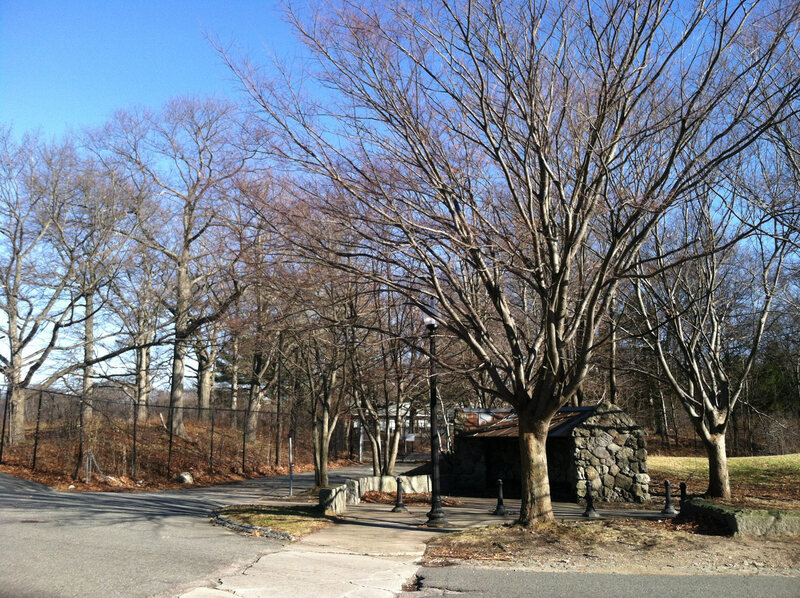 None had any indication of a building, stall or anything along Glen Lane by the Valley Gates. 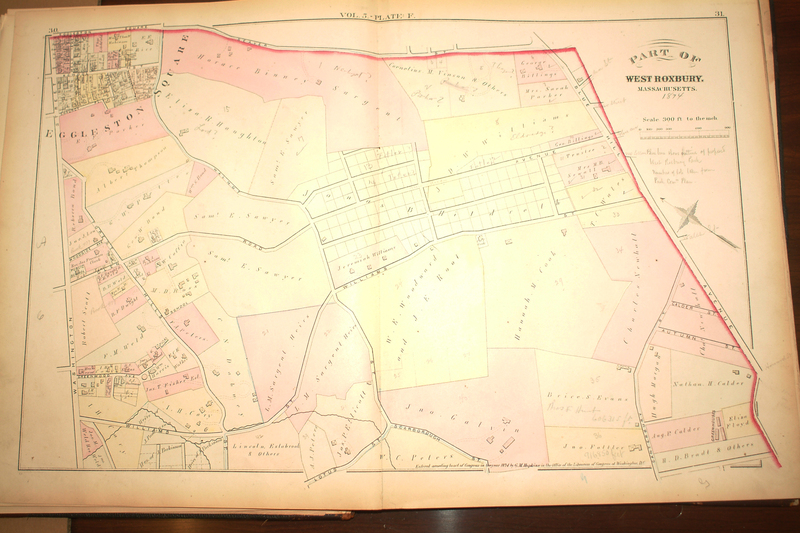 I looked at the original 1885 General Plan, the 1891 Revised Plan, as well as maps from 1896, 1899, 1905, and 1914. To the right is a detail from the 1914 map, but they are all the same really. I found this lack of evidence kind of strange, because most of the time the maps are very accurate and show a lot of the park details that have been buried or lost. But this time there was nothing. I figured this was just one of those things that I’d have to leave alone for a while, hoping a random picture or map or blog post would turn up in my internet meanderings that explained this odd, man-made alcove on Glen Lane. 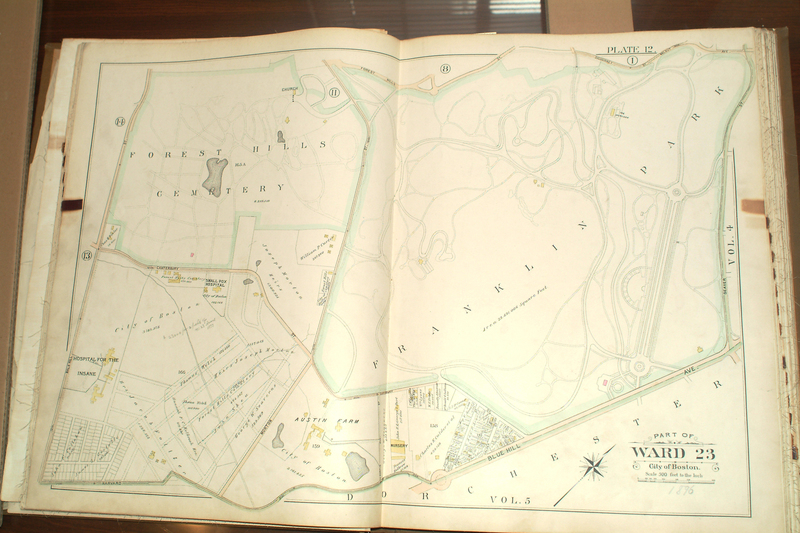 Then I decided to look at the Topographical Map of the Park from 1884, showing the roads and landscape that Olmsted would transform. 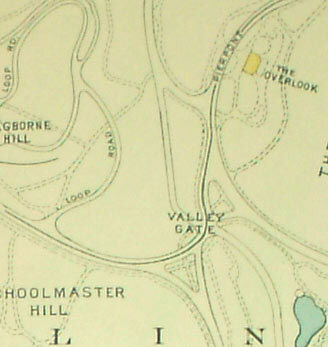 Many of the roads, including Glen Lane, were in place before the Park was constructed, and Olmsted incorporated many of them in his final plans. Looking closely at the Topographical Map, I saw that the rocky alcove existed in 1884! To the right is a detail of the map, and the space is clearly marked right where I saw it today. 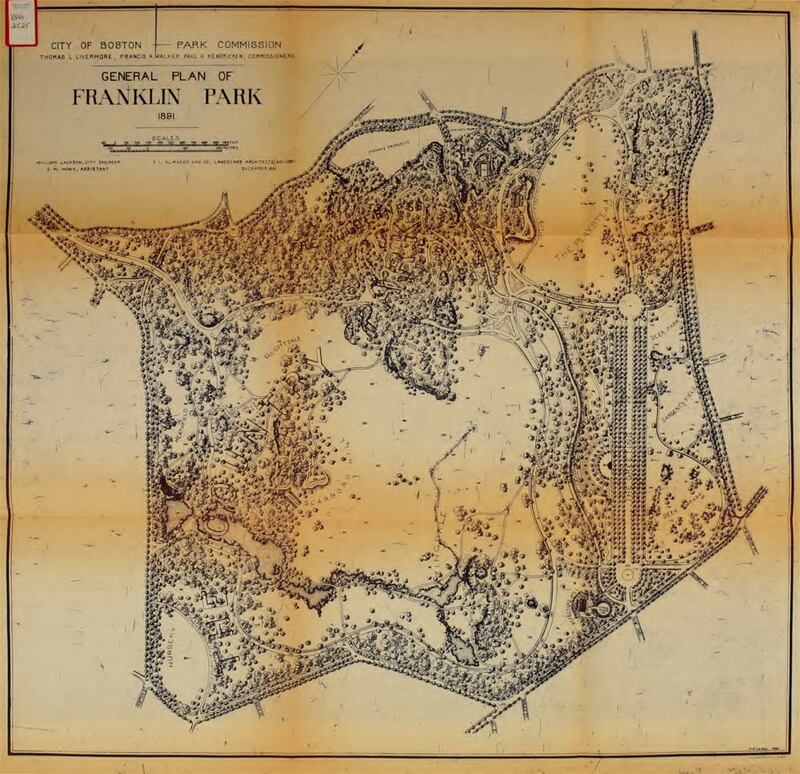 Which means that it was not part of the Franklin Park plan, but a remnant of some pre-Park farm or home. 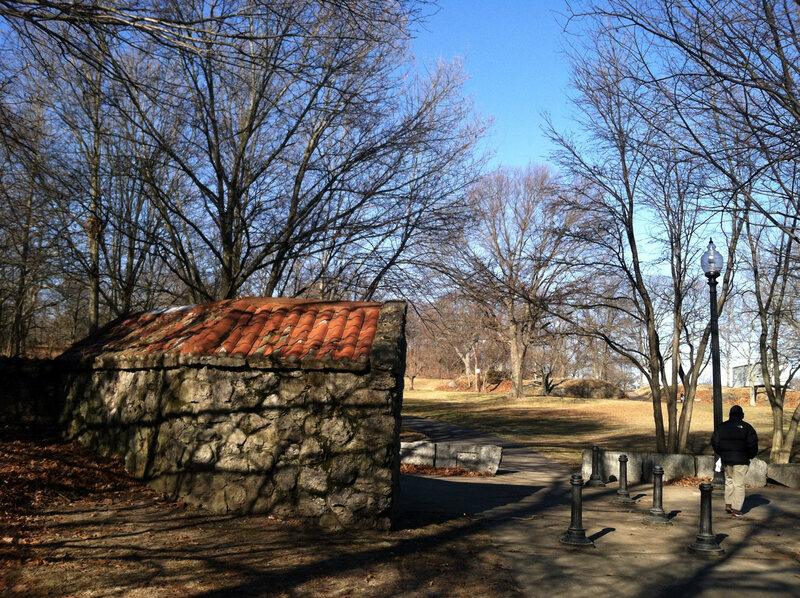 There’s no indication as to what it was for, but I found it really exciting to know that it was a piece of Boston history from before Olmsted transformed the land into his grand vision of an urban naturalist escape. This sent me off in some interesting directions, wondering about what was in the Park before the construction. 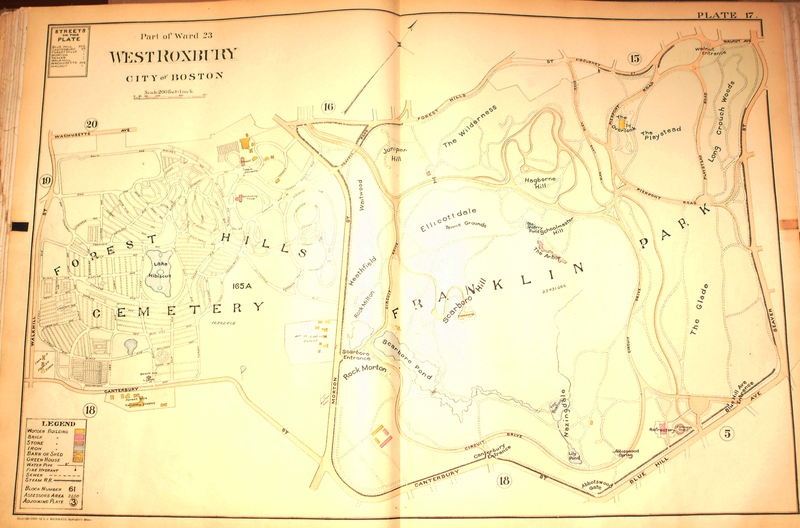 I knew some of it had been farms and land owned by families, and many of the sections of the Park still bear their names (Ellicott, Scarborough, Hagborne, Sargent) and of course Schoolmaster Hill is named for it’s famous resident, Ralph Waldo Emerson. 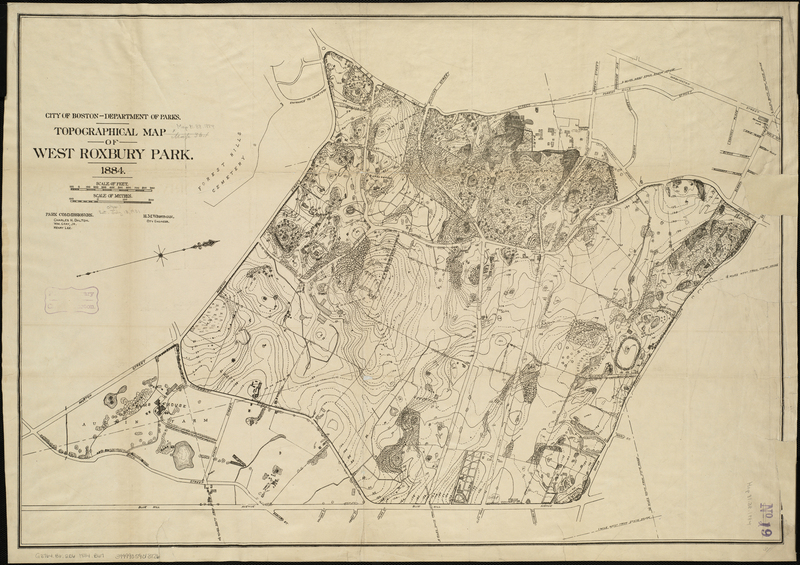 Ultimately, I ended up back at the Jamaica Plain Historical Society website, looking for maps from before the Park. 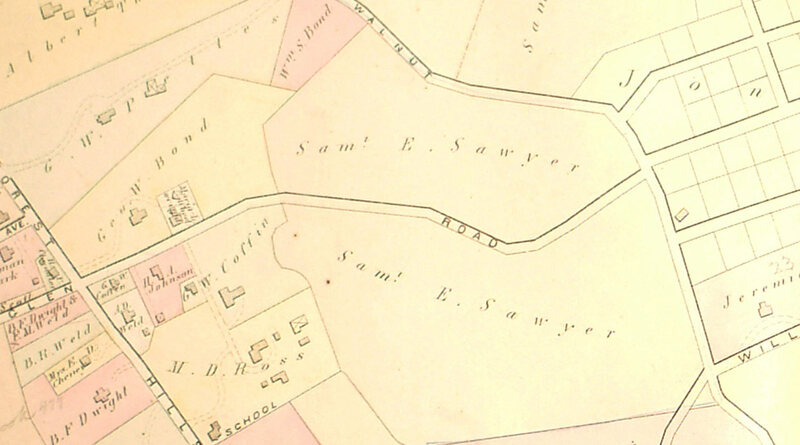 I found one from 1874, and it shows that section of Glen Road was owned by a Samuel E. Sawyer at that time. Interestingly, Sawyer is considered one of the great benefactors of the arts and the primary creator of the Gloucester Lyceum and Sawyer Free Library, which hosted lectures by notables including (surprise!) Ralph Waldo Emerson! 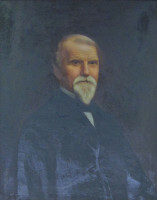 He’s best remembered as a Gloucester native (with a very nice house), but apparently he owned some of the land that would become Franklin Park. It’s not a stretch to imagine that he donated the land, or sold it willingly, when Olmsted came asking. 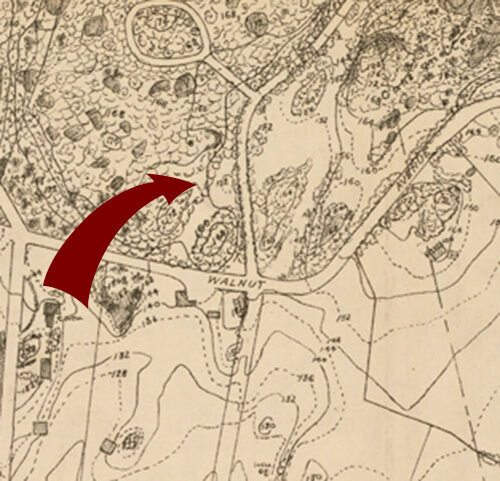 There is nothing on the 1874 map to indicate the location or usage of the alcove, or that it even existed in 1874, but it was really fascinating to see this same ground that I’ve walked so many times, and these maps that I’ve become so familiar with, from the time before the Park existed. I don’t really know anything more after looking at the 1874 map than I did before I found it, but I’m glad I spent the time to look closely at it. Standing at the Valley Gates, you can see Schoolmaster Hill, and I realize that Sawyer, benefactor of the arts, and Emerson, the great poet and philosopher were neighbors. Suddenly the Park’s history unfolds in front of me as a place of human connection far above beauty, nature or Olmsted history. Before the Park, these neighbors rose into the ranks of the Boston Brahmin and both left their marks on the world in meaningful ways. I had never expected to find any of this when I started trying to figure out what was housed in this small alcove cut out of the rock. What does all this mean? I’m not really sure. It’s another of these moments I keep having in my visits to Franklin Park where I’m excited to find a little mystery, a bit of lost past, and I keep re-experiencing the joy of discovery while imagining the history under my feet. For me, standing there and feeling that connection between then and now, from the past to the present, was amazing. I guess that’s all it ever needs to mean.